Sophisticated simulations at your fingertips! The cross-platform DSim and ControlDeck frameworks provide a new customizable solution for modeling your system and implementing the control software. Also see our VisualCommander client for Macs. It's easy to use ControlDeck with hardware in the loop. We've used it with Phidgets USB components including motors, temperature sensors and PH sensors. We've also used it with Saitek flight simulator controllers, Labjack I/O Boards and other hardware. 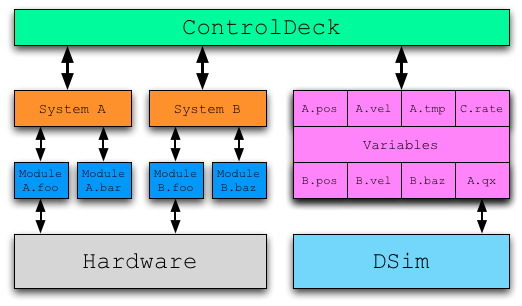 DSim and ControlDeck are cross-platform libraries and can be used on Mac, UNIX, or Windows OS. We use DSim and ControlDeck internally for all of our research and software development. Our Aero-Astro Vehicle Control products include the Spacecraft Package of DSim models, the CubeSat Control System control software bundle, and our Core GN&C software bundle included Unscented Kalman Filters. Our engineers have developed flight software for a number of successful satellite missions.